Seen from the big bay, shoreline views of the “City by the Bay” stretch forever. The San Francisco skyline rises up and around an active waterfront, Alcatraz has an eerie vibe, and Angel Island is inviting. Passing under Golden Gate Bridge soaring overhead is an unforgettable moment. Photo ops of the pristine hills of Marin Headlands dipping down into the bay and picturesque Sausalito nestled into them, are unbeatable. To the east, Bay Bridge curves over the bay and, from the west, fog billows in unexpectedly. See it all on one of many boat cruises. 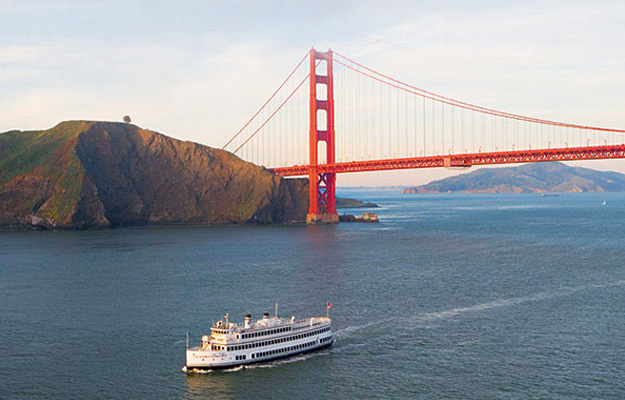 The way to choose the best San Francisco Bay cruise is to decide how you want to see it. See it by ferry, catamaran, RIB, sailboat, luxury cruising yacht, go-fast boat or fishing boat. Each experience is unique. Pick the one that works best for you. For a no-frills experience with great views, hop on one of two ferry services providing scheduled public transportation. Golden Gate Ferry departs from the Ferry Building. The Blue & Gold Ferry departs from Pier 41 in Fisherman’s Wharf. There is no narration, but the views are great on the ride to their scheduled destinations. 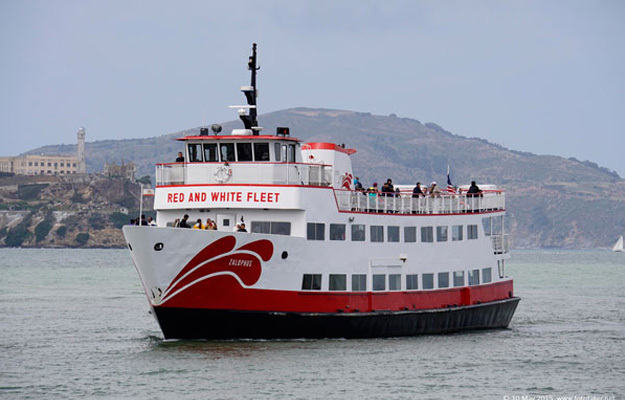 The most popular destination of both services is the Sausalito Ferry. It’s an inexpensive way to get out on the bay and spend time in Sausalito. The return trip can be crowded, especially late afternoons as tourists are leaving and bikers who bike the Golden Gate Bridge often ferry back to San Francisco, bikes in tow. Two ferry boat companies, Red & White Fleet and Blue & Gold Fleet, offer similar narrated bay cruises. The large, stable ferries are popular with visitors opting for a 1-hour narrated sightseeing experience. Both have indoor spaces with large viewing windows and outdoor decks to catch the breeze and the sights. Both go past landmarks – the skyline, shoreline neighborhoods, the Presidio, Marin Headlands, Sausalito and Angel Island. Both go under the Golden Gate Bridge and around Alcatraz. Red & White fleet departs from Pier 43½ in the heart of Fisherman’s Wharf; Blue and Gold Fleet departs from Pier 39. Family-owned Red & White Fleet tours are legendary. The fleet has been taking out visitors on bay cruises since 1892. They pride themselves in consistently excellent tours and vessels. Their 1-hour Golden Gate Bay Cruise, departing around every hour beginning at 10am, provides audio headphones in 16 languages. Their Bridge 2 Cruise adds the curving Bay Bridge, Treasure Island and AT&T Park into the mix. Celebrate the setting sun and relax in the softness of twilight on Red & White Fleet’s 2-hr. California Sunset Cruise, departing at 5 or 5:30, Nov – March. Alcatraz Island is one of San Francisco’s most notorious attractions. 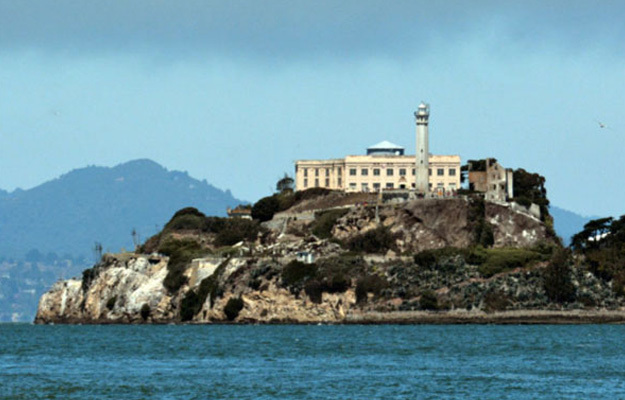 While bay cruises go around it, the only way to tour the legendary island prison is by getting there on the Alcatraz Cruises Ferry, a National Park Service concessionaire. Departing from Pier 33, the Alcatraz ferry takes tour ticket holders back and forth to “The Rock. It does not do bay tours. Adventure Cat’s Bay Sail is fun. 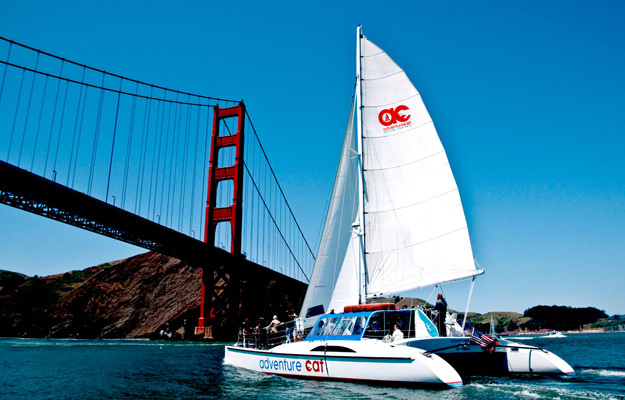 Departing daily from Pier 39, the sailing catamaran is a great choice for the adventuresome and families with kids. As the stable catamaran cuts quietly through bay, getting around the big, roomy vessel is easy. Catch spectacular views and avoid the wind in the protected cabin. Or, be prepared to get wet on the deck trampoline where the feeling of water rushing by below the netting is awesome. A friendly crew creates a great ambiance and an audio tour in 7 languages identifies the sights. Beer, wine, soda and snacks are available for purchase. Bring a jacket, wear soft-soled shoes and enjoy the ride! The tempo changes to quiet and romantic on Adventure Cat Sunset Sail. As the catamaran quietly sails west into the colors of the setting sun, take in nature’s beauty while comfortably seated in the protected cabin, sipping beer, wine or soda and tasting light hors d’oeuvres. A sail on a sleek 2-masted, mono-hull sailboat from San Francisco Sailing Company is magical. As you glide through the water on the 90-min. Daily Sail, the only sound you hear is the wind and the lapping water against the hull. In the congenial company of a limited number of passengers, it’s a mellow way to tour the bay. Sailing parallel to the Golden Gate Bridge high above is mind-blowing. A great crew, beer and wine come with the cruise. Some visitors just want a thrill ride – especially kids! Big, fast Rocket Boat delivers. Go fast, have a blast! May – October only, it’s hard to miss the yellow and red go-fast boat at Pier 39. Tickets are first come, first served. Hop on, find a seat and zoom off listening to rock music. Flying full throttle on the 30-minute ride, Alcatraz, and the skyline are a blur. Crazy maneuvers are wild. Go under the Bay Bridge, past AT&T Park and see the skyline from the north and east. RIB sightseeing on a Bay Voyager Cruise is an exciting option. Look for a close-to-the-water, 12-person rigid inflatable boat on Pier 39. That’s your ride! Climb aboard for a 90-minute, often wet, adventure to places you might otherwise not see. In addition to bayfront views, going under the Golden Gate Bridge and around Alcatraz, You’ll see sites of abandoned gold rush ships, go under the Bay Bridge, motor into estuaries, to the Port of Oakland and by AT&T Park. Fishing boats, a traditional sight along San Francisco’s waterfront, usually take chartered fishing trips. Some also take visitors on “open load” bay cruises. Head to the docks around Jones and Jefferson Streets. Check out Chucky’s Pride Sportsfishing, Lovely Martha Sport Fishing, Captain Joe’s Sportsfishing Charter, Silver Fox Sportsfishing & Tours and Wacky Jacky to see if they’re taking out bay cruises that day. It’s as authentic as it gets. There is no better way to unwind and see the sights than on a 2 or 3-hour cruise on a large, luxury Hornblower yacht. Excellent service, elegant ambiance, good food prepared by local chefs with seasonal local ingredients, and spectacular views are a winning combination. 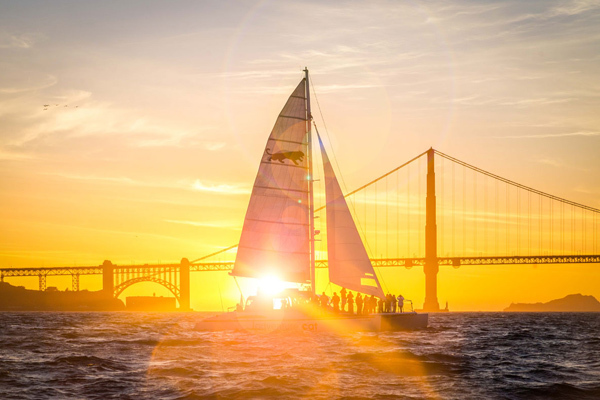 San Francisco Supper Club Cruise navigates around the big bay for 3 hours on Friday and Saturday evenings, January – November. The relaxed, sophisticated tone is set by the glass of champagne served upon boarding. Small-plate stations offer choices for every palate. Watch the city sparkling in evening lights from the decks or from viewing windows as you dance to music spun by a DJ. San Francisco Brunch Cruise, offered Saturdays and Sundays year-round, brings the hectic land sightseeing pace down a notch for 2 hours. The brunch buffet is loaded with choices, sparkling wine free-flows, live music plays in the background, and the cash bar serves favorite drinks. 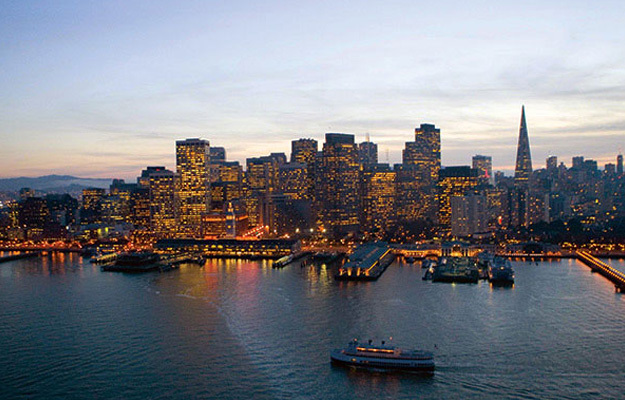 Begin your 3-hour San Francisco Mid-week Dinner Cruise or San Francisco Weekend Dinner Cruise by unwinding with cocktails on the deck as the grand yacht navigates past the twinkling City by the Bay. It’s a gorgeous light show. Make your way to your table in the interior salons for a delicious, elegantly served dinner glancing, taking in bay front sights as they come into view through huge windows. Then dance to music spun by a DJ until the boat docks back at Pier E on the Embarcadero.